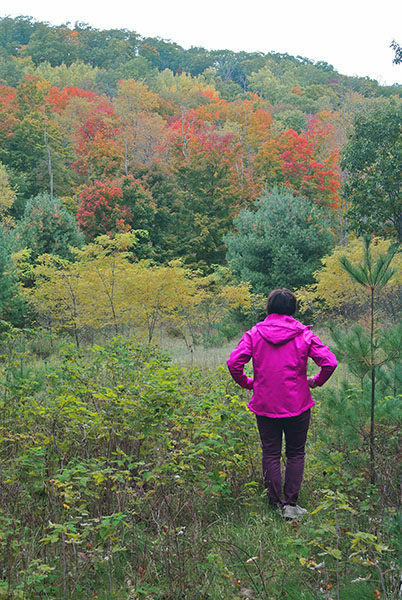 Located almost due east of Glen Arbor and within a mile of Sleeping Bear Dunes National Lakeshore in three different directions, Krumwiede is Leelanau Conservancy’s first forest reserve. Winding up, over and around the Krumwiede ridge are the reserve’s 2.2 miles of trails. Forestry Loop is the perimeter of the system, a 1.8-mile trek. This hike, however, is a 1.7-mile outing that includes the Ridgeline Trail, which departs from the Forestry Loop to follow the crest of the ridge. There are no spectacular views from Krumwiede Forest Reserve. There are no panoramas of Lake Michigan or islands or golden dunes towering above the shoreline. In the middle of the summer, when the foliage is thick and green, there are no views at all. But in October, climb the ridge that dominates the 110-acre tract and the hardwoods will be burning with autumn reds, yellows, oranges and purples. At times like this every step of your hike is a sight to behold. 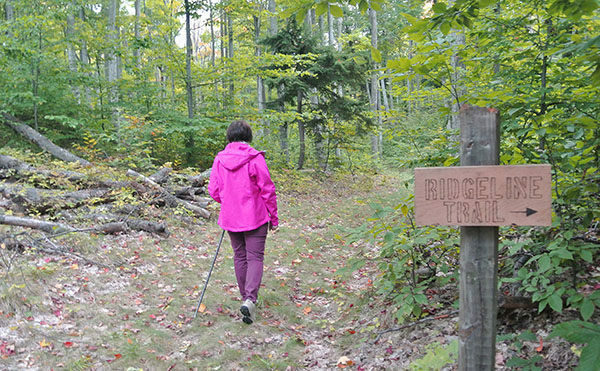 Located almost due east of Glen Arbor and within a mile of Sleeping Bear Dunes National Lakeshore in three different directions, Krumwiede is Leelanau Conservancy’s first forest reserve. When the Krumwiede family donated a conservation easement on the land in 1997, they reserved the right to manage the forest as a commercial timberland. When they donated the land outright to the Leelanau Conservancy in 2007, the commercial harvests continued as a way to demonstrate and promote sustainable timber production. Krumwiede is an excellent example of the powerful glacial activity that took place in Michigan more than 10,000 years ago. Signs of glaciers are everywhere in the reserve. The 241-foot high ridge is a lateral moraine, a parallel ridge of debris deposited along the sides of a glacier. The valley west of the ridge, which Wheeler Road winds through, is an ancient glacial drainage channel. Crowning the ridge, right along the trail, is an erratic, a huge boulder that was deposited after the glaciers receded. Winding up, over and around the Krumwiede ridge are the reserve’s 2.2 miles of trails. Forestry Loop is the perimeter of the system, a 1.8-mile trek. 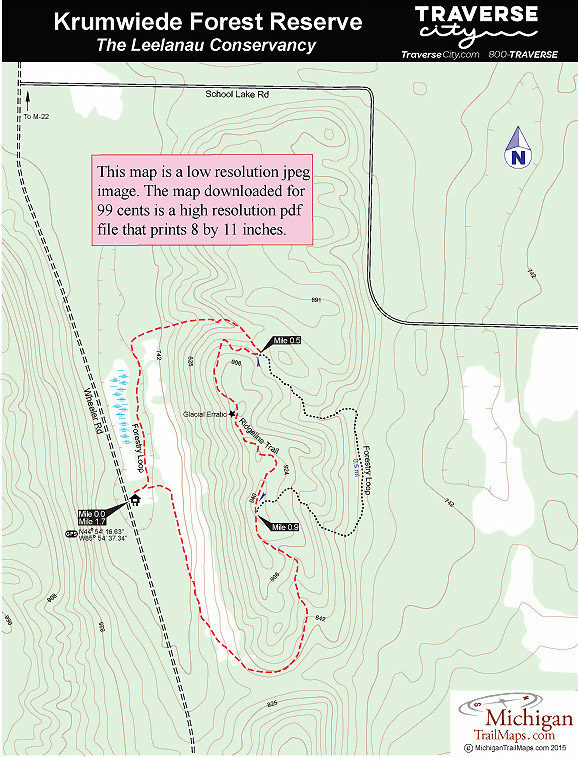 This hike, however, is a 1.7-mile outing that includes the Ridgeline Trail, which departs from the Forestry Loop to follow the crest of the ridge. Just beyond the trailhead information display is the junction of the return from the Forestry Loop. Head north (left) and the trail begins in a lightly wooded strip bordering a grassy field on one side and a northern wet meadow on the other. Within a quarter mile the Forestry Loop swings east and begins climbing as an old two-track. The trail is wide and the climb steady but not steep. At Mile 0.5 is the first posted junction with Ridgeline Trail. Forestry Loop is the former two-track that descends to the southeast (left) before re-climbing the ridge. The descent along this half-mile stretch is sharp and the climb back to the crest of the ridge even steeper as you gain 150 feet in less than a quarter mile. Ridgeline Trail splits off to the west (right) as a true foot path and begins with a short ascent before following the undulating crest of the forested ridge. Other than possibly in winter, there are no views through the trees. But you know you’re on a ridge — and a tall one at that — as you look down steep slopes to the west. At Mile 0.7, the trail passes a huge glacial erratic. 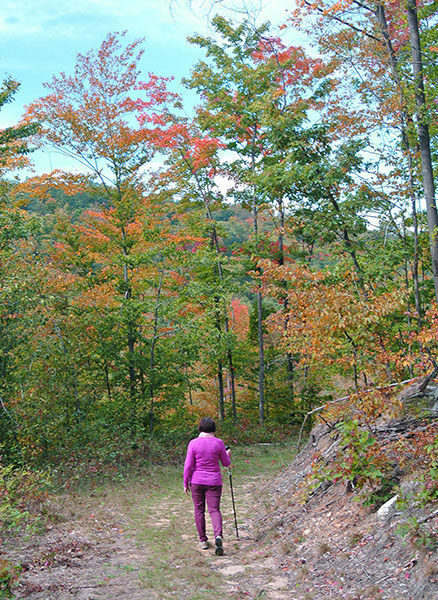 Ridgeline Trail reaches its second junction with Forestry Loop at Mile 0.9, close to the high point of the ridge at almost 950 feet. Continue right and the trail descends steadily for almost a half mile, bottoming out where Forestry Loop swings north into an open field. Continue for almost another quarter mile to reach the trailhead. In summer, if your timing is right, wild raspberries will be ripe for the picking. The Krumwiede Trailhead has parking for only three or four vehicles but no other facilities. Krumwiede is open year-round and is an excellent destination for snowshoers and backcountry Nordic skiers. Winter visitors often choose the Forestry Loop, a former two-track that now makes for a wide trail and is much more forgiving to an occasional spill. There are fees to visit Krumwiede Forest Reserve. From Glen Arbor, head northeast on M-22 and within 6 miles turn south (right) on Wheeler Road. The Krumweide Forest Reserve trailhead is on the east side of the road, 2.2 miles south of M-22. For more information, contact the Leelanau Conservancy (231-256-9669; leelanauconservancy.org). For lodging or travel information contact Traverse City Tourism (800-872-8377; www.traversecity.com).